I would SOOOOO appreciate your help! 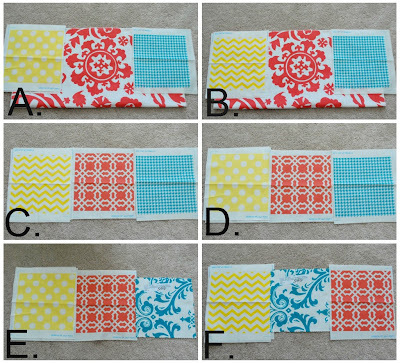 I finally got all the fabric samples for the nursery and now I can't decide what I want! Will you PLEASE help me?! Here is a photo of all my samples in the different combinations. Just leave a comment with the letter of your favorite combination. This fabric will be used for the crib bumper (2 patterns- one on each side) and then for the crib skirt which will use all 3 patterns. I will then scatter the fabric here and there around the room in small doses. And here is a shot of the fabric with the crib and my new wall art just for reference. Very, very cute! LOve the colors! A and D are my faves. Love A. E is my second favorite. I like them the way you have them arranged on the crib--use them all! Good luck, your baby will love it no matter what! You're already a good mom to care about this! They would all look fab, but my favorite combos are C & D.
I love all of them together in that last shot. Is there a way to incorporate them all? I like A and F! I vote B, A is a close second! I like F best. 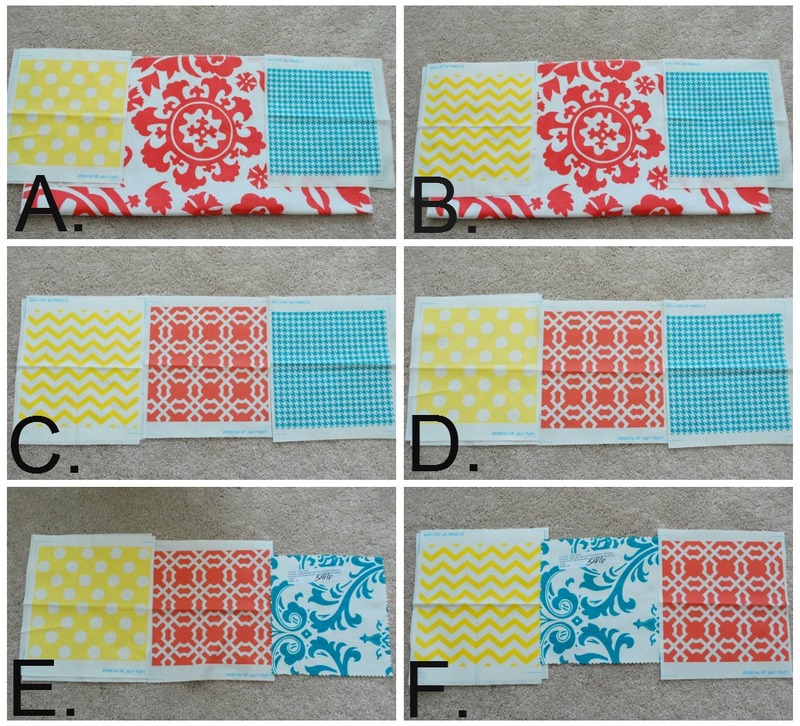 I love the yellow polka dot, but I think the yellow chevron is a better scale for the turquoise floral. Looking forward to seeing what you end up going with. I like E and F! All look great and I agree with above: Is there a way to incorporate them all? Or maybe use the ones you don't use for the crib to make your own boppy cover or bumbo cover or a pillow for whatever chair you may have in the room? I vote B first and A as a second choice. :) They are all adorable though. My vote's with B with F running a close second. A mom sent in a photo to our contest not long ago that used something similar to the turqoise pattern on her baby's furniture. It's really cute and you might be interested to see another way to use it other than in fabric? Oh, so cute. Such great fabrics you are using. I love the letters behind the crib. My vote is B. Really love that combo with the bold pattern in the middle. I think whatever ones you use will look nice as I like them all. If you have a changing table maybe what you don't use in can incorporate on there on if you have a rocker cover a cushion for accent or maybe a couple little pillows or even some cute little curtains. Lots of possibilities to where you can mix and match those colors. I love "F" too!!! I didn't look at anyone's comment before I voted!!! Look at all the "F"'s!!! B!!! The large red print is too gorgeous to give up!! I vote for C. The scale of all 3 fabrics is similar and will give a balanced look throughout the room. I prefer A! Love the coral floral and polka dots are just darling in a little girls room! I like B or F.